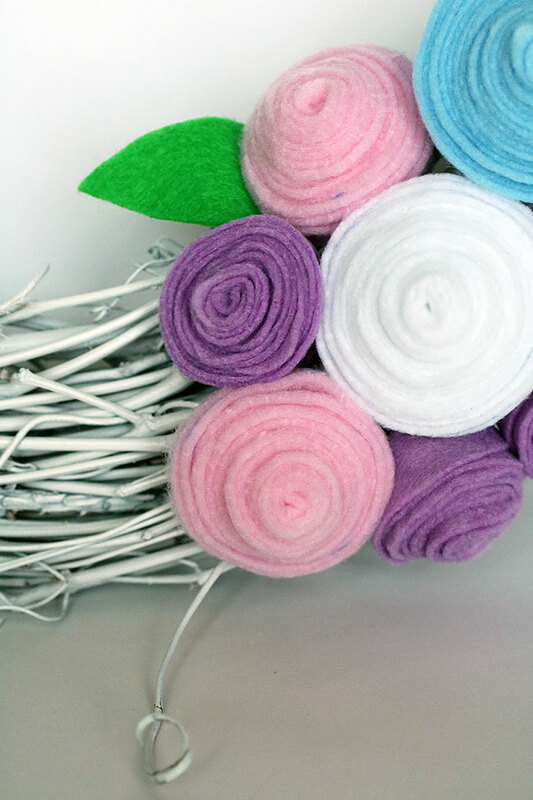 Valentine’s Day is over… and, I am ready for the Spring! 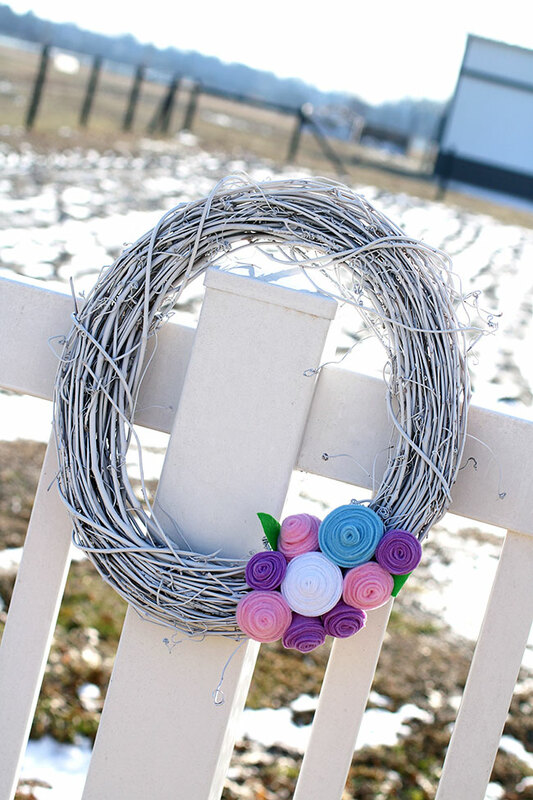 Recently I made a wreath for Autumn’s room and the grapevine wreath and the felt colors make me think of early Spring… so does the snow in the background. 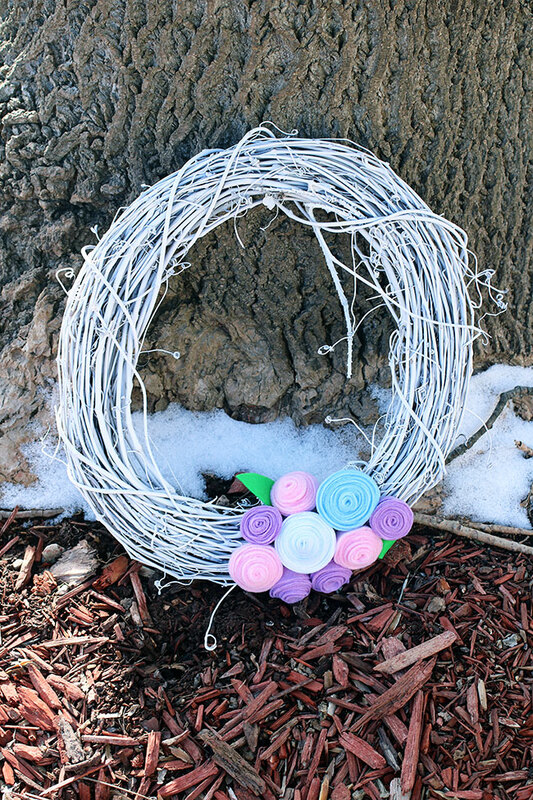 😉 This wreath was really easy to make and I did something unique in that I spray painted the grapevine wreath white! I haven’t seen this done before and I wasn’t sure how it would turn out, but the spray paint covered it wonderfully! 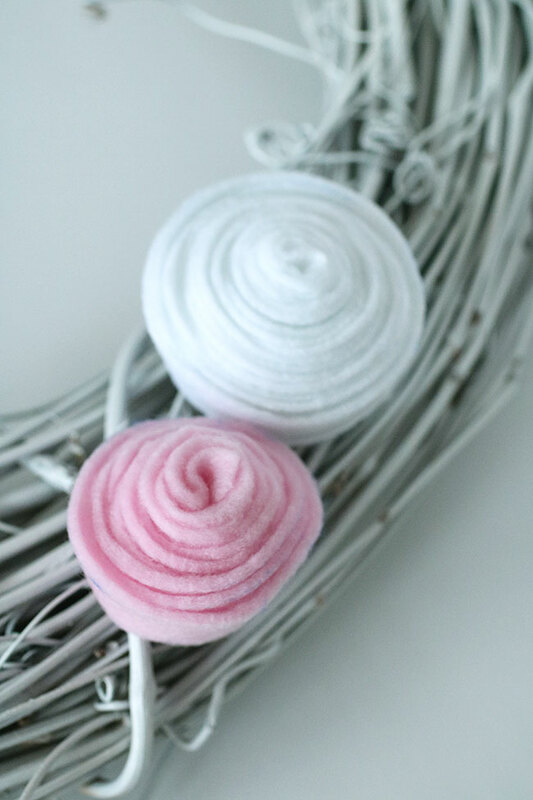 I also created some felt rosettes (tutorial below) and a couple of felt leaves. I was really pleased with how the wreath turned out and Autumn loves it, too! 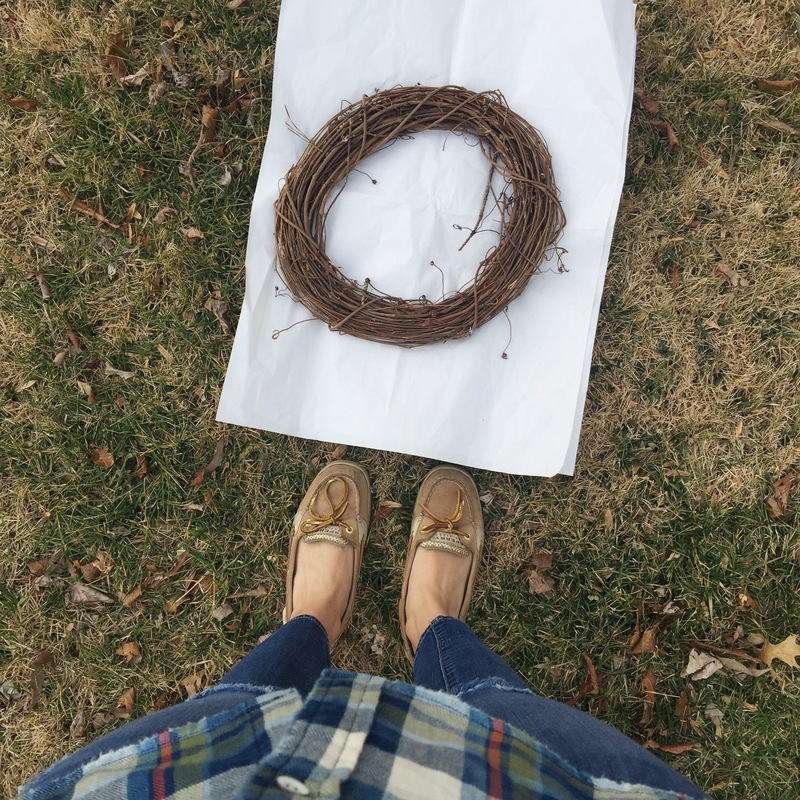 The first step was taking the grapevine wreath outside to spray paint it. 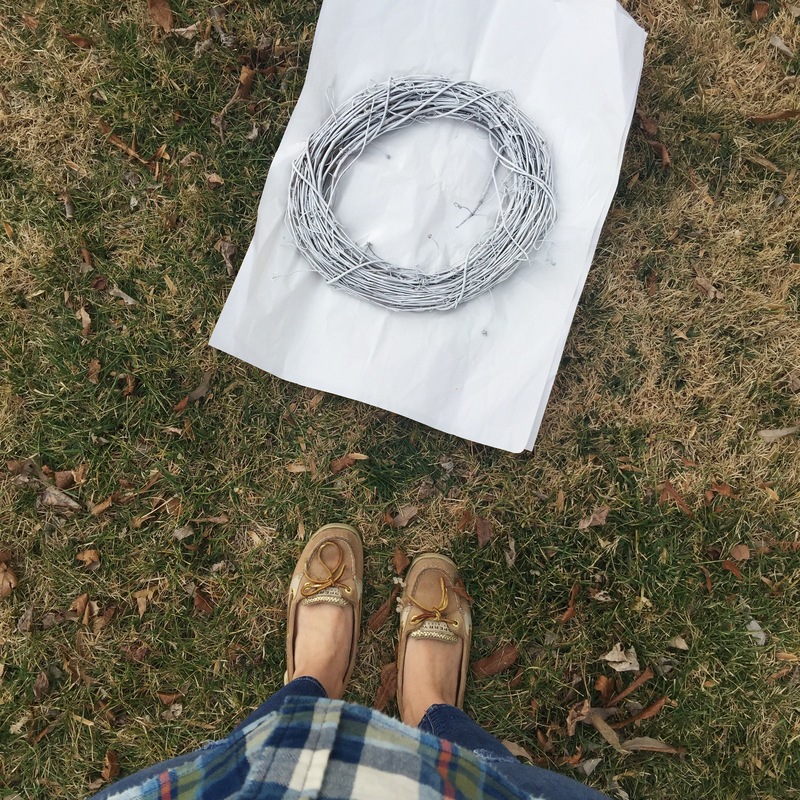 The photo on the right shows what the wreath looked like after two coats of a white spray paint with primer. Once the grapevine wreath was dry, I brought it inside and selected the felt colors for the rosettes. 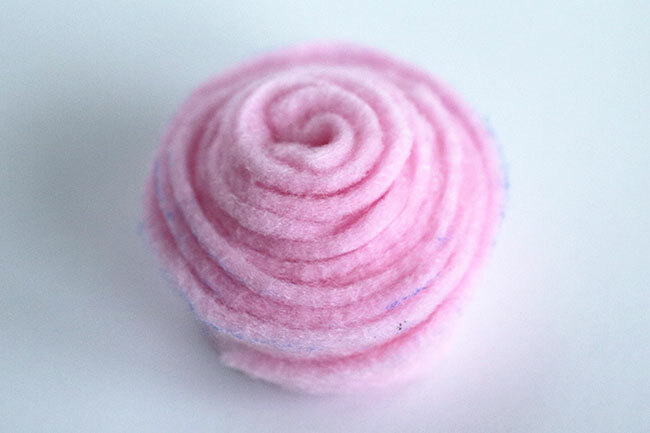 I had never made a felt rosettes before, but it is a little different from how you make a fabric rosette. 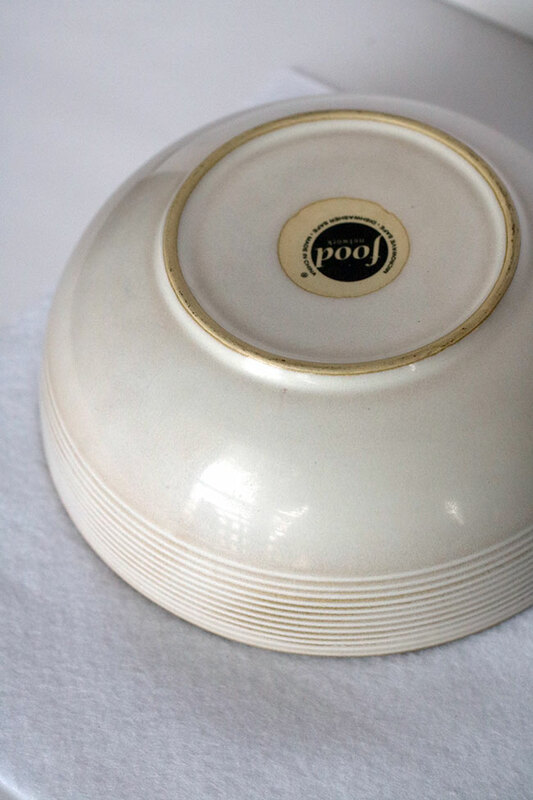 First, you want to find a round object in your house to trace a circle around. 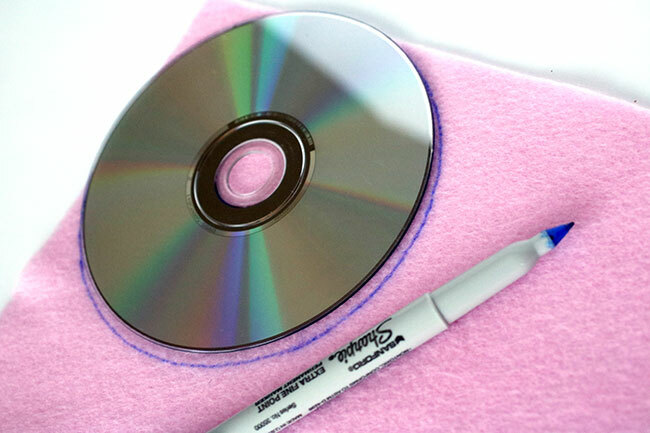 I used a DVD and a sharpie marker. 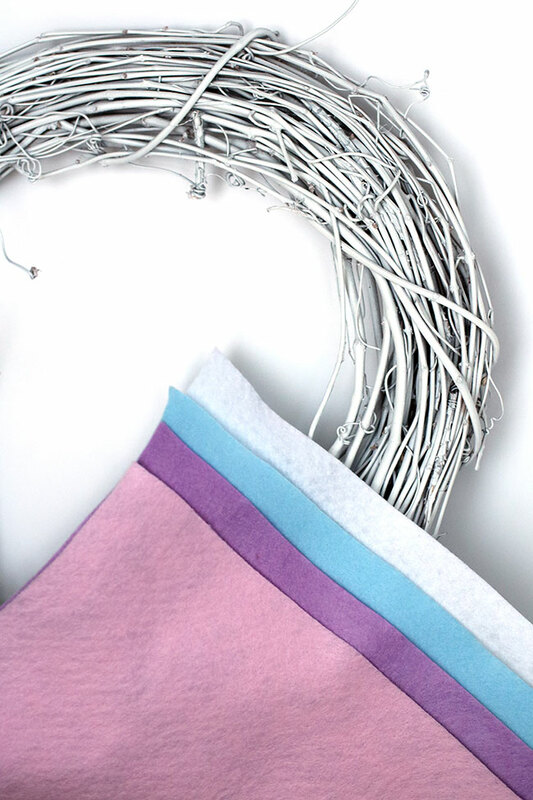 If you want to do rosettes in different sizes, you can find other objects around the house to trace around. I used a bowl to make two rosettes that were slightly larger. Cut the circle out and then cut around the inside of the circle in a spiral pattern (as pictured above). 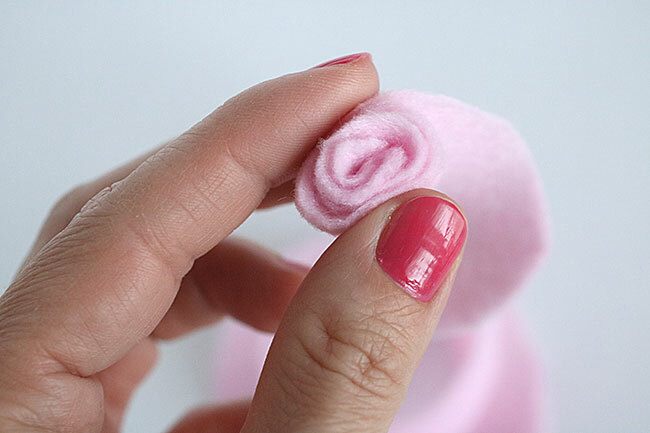 Then from the center, wrap the felt around and around to make a rosette. I used a hot glue gun to seal the end of the rosette. 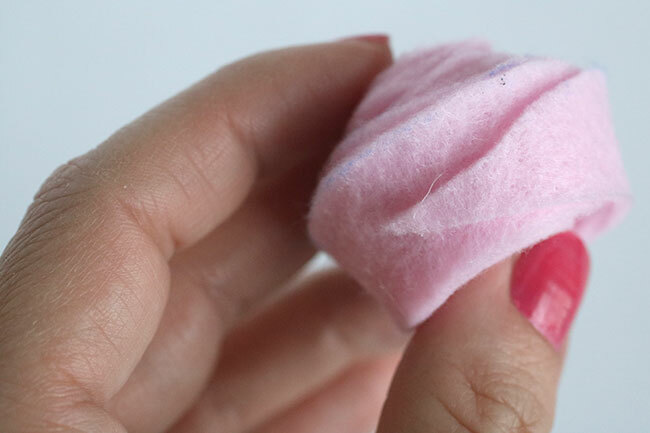 You could also use fabric glue. 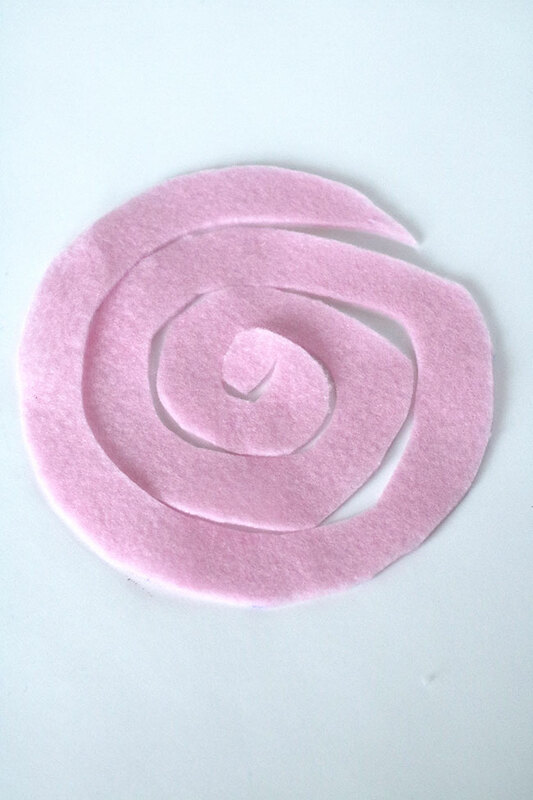 This is what the felt rosette looked like once I was done. Then I hot glued the rosettes onto the wreath once I had finished them all. As an after thought, I added a couple of leaves using green felt. 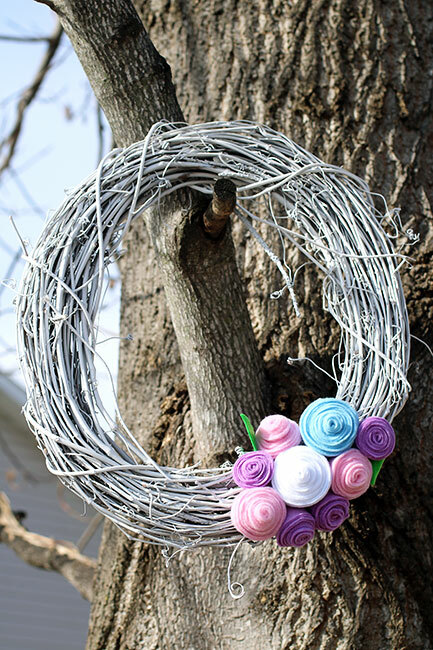 And, here is what the wreath looked like after I was finished!